Canadian internationalist feminist Lori Hanson, who has been working in solidarity with rural Nicaraguans for more than 30 years, has just returned from Nicaragua. Jack Hicks interviewed her for New Socialist. Together, they crafted this piece based on the interview and an article Lori previously wrote for the Greek newspaper, AlterThess. The analysis of an emerging movement in Nicaragua is a work in progress for Lori, who continues to work with Nicaraguans on the deeper meaning of a 44 day-long uprising and the state violence that has accompanied it in April and May, 2018. Hicks: You left Nicaragua on Monday, May 28. What was the situation there when you left? Hanson: Last Monday morning students from the Nicaraguan University of Engineering (UNI) decided to return to occupying their campus in solidarity with the students of three other public universities in Managua, that have been en las trincheras – barricaded in and occupying the universities since April 19. UNI is of symbolic importance to the regime of President Daniel Ortega as many engineers, IT specialists, and others graduate from it, providing the technical brains to operationalize Ortega’s pseudo-socialist, neoliberal extractivist, crony capitalist agenda. Although spontaneous, leaderless, and uncoordinated in their initial self-organized (autoconvocado) mobilizations, the anger that welled up after the first students were killed on April 19 quickly manifested in university students and other civilians working to support each other across the country. The movement didn’t get its start in April – there are antecedents – but the spark has ignited, and it has grown exponentially over the past 45 days. UNI students had been participating in the occupations of the other universities, but it would seem that their return to take their campus took the regime by surprise. By noon on Monday, para-police forces – known locally as turbas – had moved on the campus. Videos show Hilux trucks filled with armed men shooting wildly from the street. The riot squad police joined them later in the afternoon. It was a renewed level of response and repression – the police had been absent, some say in civil disguise, for days. At the end of the day there were two more dead and reports of 22 to 40 detained. 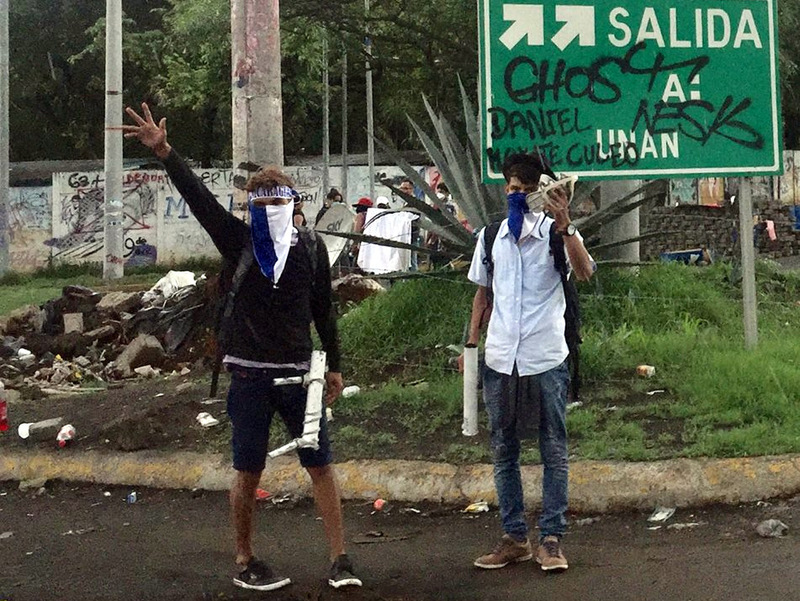 The America’s director of Amnesty International was on the campus during the stand-off with the forces of repression, and posted powerful cellphone video of the attack. There are varying reports of who these autoconvocado students are as a group. One source said the front-line militants (armed for self-defence with homemade mortars, maintaining the barricades) are the becados – students with scholarships, while supplies and rearguard activity are provided by the better off students. Various previous student groups have also provided experience and know-how – some of those movements being #OccupyINSS in 2013 and the more recent #IndioMaiz environmental movement. 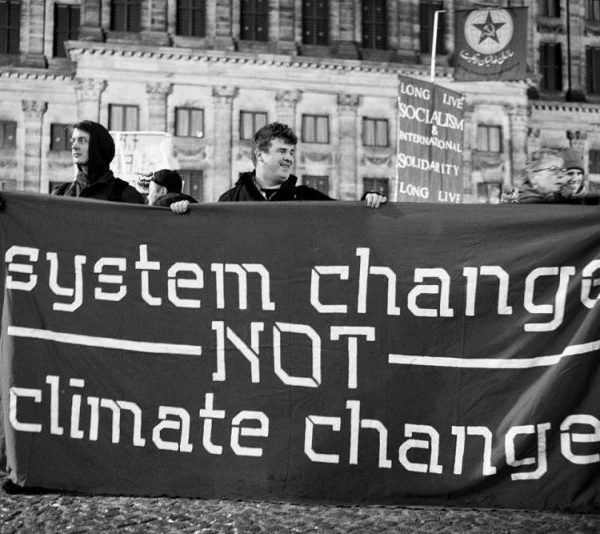 The movement has experimented with bottom-up, social network-based approaches that challenge what they see as a rigid hierarchical, top-down, party driven system. The movement has so far apparently avoided engaging with any particular ideology, labour unions or political parties. Its members seem to mistrust the business sector, but clearly there are no anti-capitalist slogans leading their fight. They are driven, much like the Spanish indignados, by a sense of moral indignation to what they see as a corrupt and authoritarian government. Additionally, from my sources, it would seem that at least some students come from what are ‘critical Sandinista’ backgrounds. Their parents fought in the insurrection and the war and to a certain extent they grew up believing in the original Sandinista revolutionary values and platform. Their parents have or had jobs in the Sandinista state apparatus and lots of kids they know got scholarships as a result, in part, of party connections. Growing up in ‘political’ households, hearing mounting criticism of Ortega and his regime – the authoritarian style of government, the rigged elections, and the obvious kleptocracy – influenced their thinking. In the mix of people involved are also those influenced by family and friends who had long since left the FSLN (the ruling Sandinista party) and joined the Sandinista Renovation Movement (MRS, which formed from a split in the party between the ‘old guard’ of the party and more centrist social democrats). The MRS is detested by the regime, and in official media quietly blamed for the “soft coup” that the government claims the students are providing fodder for. That explanation for the uprising does not hold water though, if only because the MRS has no significant base of support. Still, the ‘critical Sandinista’ students would appear to have played a role in the occupations and the roadblocks – and in garnering support for the resistance more generally. Hicks: Roadblocks are a key strategy being utilized by the student movement. What was travel in the country like? Hanson: When I travelled north along the Pan-American Highway to Estelí, I passed through five different tranques (roadblocks) set up and maintained by students with local community support. Think about that – students control movement along the main transportation artery of the country, which connects Canada and the US through Central America and south as far as Argentina and Chile. In that way, the students are having a huge impact on the economy of Nicaragua (estimates of economic loss and decrease in the growth rate are staggering). Neighbouring countries are also counting their losses. But excepting sporadic para-police activity, the government hasn’t acted to remove them. Removal of the barricades was the government’s #1 demand in the first round of the truncated ‘national dialogue’. (The student representatives’ #1 demand was an end to the repression). At the tranques, I had students with t-shirts covering their faces (encapuchados) and home-made mortars in their hands stick their head in my car, inquire about who I was and where I was going, and then with a smile say that there was nothing to worry about – “We’re letting people through, it’s going to be about half an hour.” They were simply making the point that they control the road. On the way back south to Managua I travelled in a car carrying two people to dialysis treatment in the capital, and we were allowed to drive around the roadblock without having to wait. Allowing ambulances and disabled or sick people through is part of an ethical code that is both known and publicized, but nowhere written. Speaking with the students there were scant key messages, some clear demands, slogans using words like democracy and justice… but no particular platform. I saw and heard no evidence that they have developed links with workers (all unions in Nicaragua are tightly integrated into the Ortega regime), but they clearly have mass support. For example, the barrio surrounding the UPOLI is supplying the occupying students with food and water – and protection. 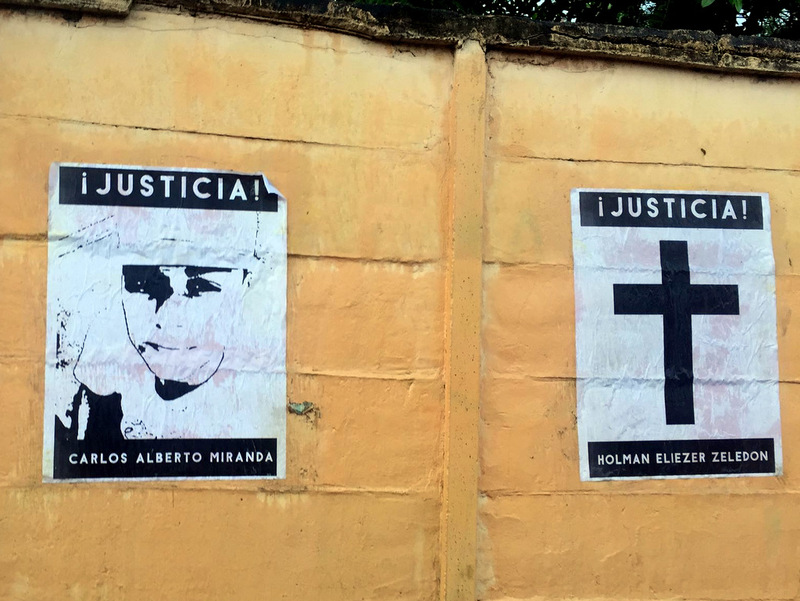 The exterior walls of colleges and campuses in Managua have been plastered with memorials to students who have been killed in recent weeks. In many ways, the student-initiated uprising is a remarkable example of mobilization from below, of horizontal democratic organizing. (It is older militants who, while supportive, have trouble envisioning this kind of organizing.) It is also an illustration of how quickly a political situation can change once the lid blows off the pot. One day students are studying engineering, medicine, etc., and a few days later they’re leading demonstrations against the government, occupying their campuses, and building and maintaining roadblocks. And, we must never forget, being shot down by the regime. The level of violence on the part of the regime has been staggering – especially in a country which suffered a full-on war within living memory. Only trained sharpshooters would be able to kill so many young people with shots to their heads, necks and chests. Hicks: What has happened since you left? On Wednesday morning an opinion poll conducted by Gallup was publicized. According to the poll, the most trusted public figure in the country is Cardinal Leopoldo Brenes, who is moderating the deadlocked (and currently suspended) ‘national dialogue’ between the government and the civil society alliance, which includes various movement actors, labor and the students. (Ortega appeared only at the first meeting of the dialogue, where a student representative called him “an assassin” to his face on live national TV). Second most trusted is Silvio José Báez, the progressive Auxiliary Bishop of Managua, who has been openly on the side of the students. The third is business magnate Carlos Pellas, by far the richest man in the country. So there you have it: at a time of popular insurrection, two of the three most respected people in the country are Catholic Bishops and the third is Nicaragua’s only billionaire. On Wednesday, May 30, Pellas gave a media interview in which he said that the way forward for the country is through early national elections. (Ortega was last elected President in 2016, and has three years left in his term.) So we see the richest capitalist in one of the poorest countries in the Americas, who along with the rest of the capitalist class had found it possible to live with a dictator who cloaks himself in revolutionary nostalgia while implementing neoliberalism, saying that perhaps the time for change has come. That being said, Pellas knows full well that if elections were held tomorrow Ortega might well win them. Even while the Gallup poll showed that Ortega’s support had waned from 52 to 31%, the constitutional changes he orchestrated as an opposition leader with a previous conservative President – known as “the pact” – require only one round of voting and any party with 35% or more wins. We cannot underestimate the support that Ortega (as the supposed embodiment of a hard-won revolution against a previous dictator) continues to have in some parts of the country, or the lengths that FSLN cadre will go to in order to maintain their positions and privilege. Meanwhile, across the city at the counter-demonstration, Ortega vowed to stay in power. He declared that the country is “not private property,” in allusion to the Chamber of Commerce having earlier that day publicly demanded that Ortega call early elections. The call for early elections has now been echoed across the world; today the European Parliament joined the call. The slaughter of students was only part of the story on Wednesday. 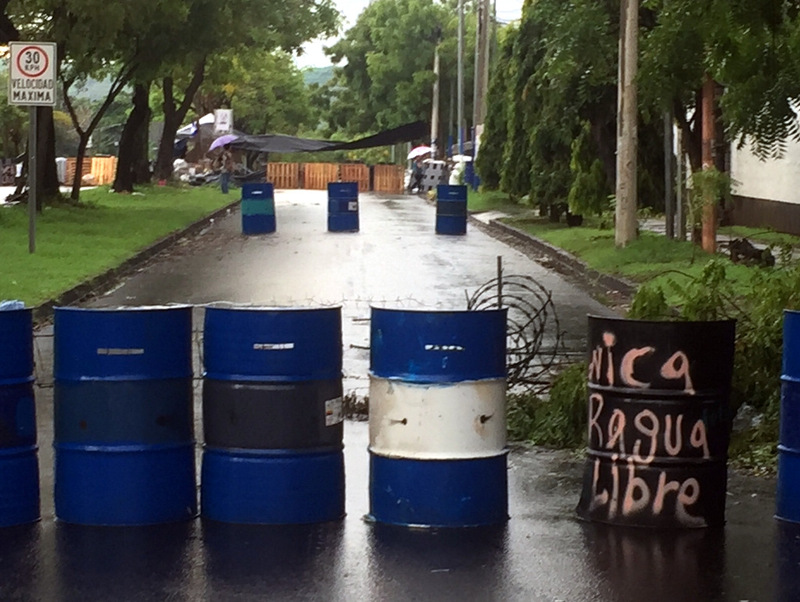 On the Pan-American highway, students at the roadblocks had also dug in – preventing buses full of Ortega supporters from getting to Managua for their march. The FSLN supporters were apparently fired on, one was killed, and others wounded. While unconfirmed, the likely story is it that there was an armed group supporting the students that did the shooting. It would seem that there are those that are re-arming in the rural areas, that divisions are deepening, and it is likely that more violence is in the forecast. Rural and urban Nicaragua have always been two different things. Nicaragua’s poor are primarily rural people with the wealth of urban business and middle-class dependent on continuing unequal economic relationships and cheap labour. On Friday, June 1, the IACHR adopted “a precautionary measure to protect the rights to life and personal integrity” of Bishop Báez, who has been receiving death threats. This amounts to a public statement that someone’s life is at risk, and that they require protection. The IACHR had previously done the same for the 13 student representatives who participated in the National Dialogue, as they too received death threats. 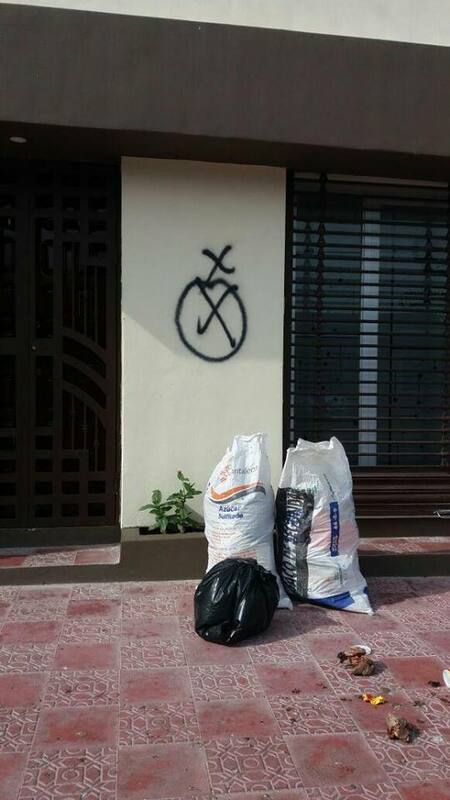 And in Estelí, doctors who had been seen participating in student-led marches woke up to find that black X’s had been spray-painted on their front doors. Hicks: What might happen next? Hanson: Some historical reminders may be in order to understand where this may go next. One cannot ignore that Ortega’s second presidency ominously began in 2007 with a crackdown on social movements; one of his first acts in power was the arrest of leaders of the autonomous women’s movement. As an astute politico-military leader, Ortega has assured his own survival by eliminating the power of any opposition, ensuring a favorable climate for the capitalist class, and keeping his head down in the trenches. From his bunkered down position, he has assured his own party and family ascendency by assuring FSLN control over the judicial, electoral, legislative and executive branches of government and over the major radio, TV, and print media. And he has grown increasingly out of touch with reality, yet he has a vast arsenal and loyal foot-soldiers at his disposal. And let us be clear – Nicaragua is a post-war country, with an excess of hyper-masculinized machismo and pent-up anger. I don’t see in the immediate future a Nicaraguan society moving toward a less oppressive or anti-capitalist direction, nor toward a lessening of existing social cleavages. The regressive forces of ‘Ortegueismo’, with its repressive authoritarian neo-liberal political platform has for too many years been presenting an antiquated, degenerated version of so-called socialist politics. Meanwhile the critically thinking progressive left in Nicaragua has been further marginalized and is in disarray. It will be difficult, if not impossible, for the outcome of uprising to correct this historic fact. 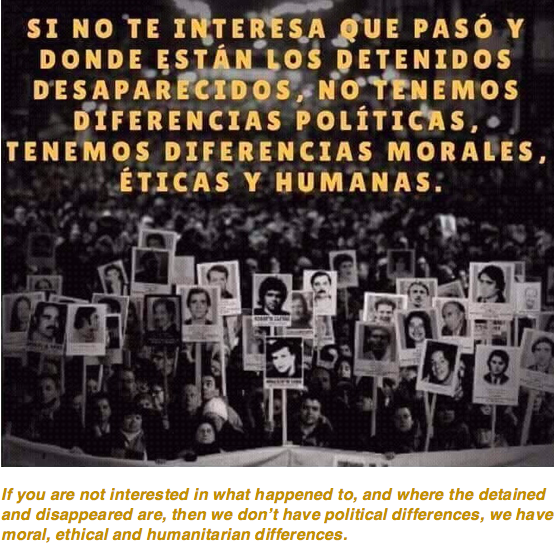 And yet, analysts and opportunists of every political stripe including right wing parties, official and opposition media, church hierarchies, disaffected and critical Sandinistas, anti-imperialist ALBA (Bolivarian alliance) allies (and their mouthpiece teleSUR, whose coverage has been uncritically pro-Ortega), and even sections of the progressive left have used events of the past 44 days to support their own version of the emergent movement and oppositional events in the country. Apologists for the authoritarian left like to delegitimize uprisings like the one in Nicaragua. Non-authoritarian socialists like to read more into them than they warrant. This is anything but a socialist uprising – it is popular uprising that merits attention as it has the potential to open space for a grassroots, horizontal movement to develop, and perhaps within the ranks of that movement there are seeds of a new socialism. But those seeds are unlikely to germinate any time soon. Here are some considerations when thinking about the future. 1) The Nicaraguan army may or may not enter the fray – there are laws of national security that Ortega could use to justify a military crack-down. 2) Capitalists in Nicaragua are ever ready to pounce on the opportunity offered by the crisis. They have no intention of losing ground here, and may well gain a lot. It says a lot that while a general distrust of business leaders is claimed by students, that does not translate to a mistrust of the country’s biggest capitalists. 3) This could well turn from an urban uprising to a war of attrition, hurting the rural poor the most. Such a war would deepen FSLN support – and remember they are but a few percentage points away from a sure re-election. 4) No opposition political parties are in any kind of shape to win an election, were one to be called any time soon. There are some parallels here to the spontaneity and lack of political program of the Arab Spring uprisings. Questions arise about the role of the autoconvocados movement in a hypothetic post-Ortega future, such as whether and, if so to what extent, will it become a mainstream political force in the country’s politics? Will it simply implode? Or, having learned hard lessons about state power, might some students realize that their interests lie with workers rather than with capitalists? With a feminist future, rather than a militarist one? The two most likely scenarios for Nicaragua at present seem to me to be either a war of attrition between the Ortega regime and its opponents, or a bloodbath. 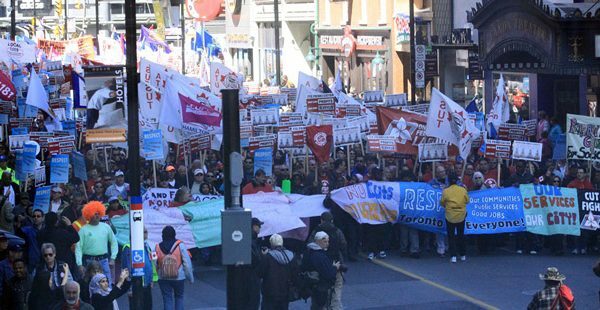 Students and workers have the potential of building a third possible outcome. It is true that the uprising was a much-needed empowering act for a generation of youth that have been disenfranchised, disillusioned and angry – made impotent by a political party/family/state that obsessively cultivated and desperately hung to power for the party and its members. The hope will come through continued mobilization and articulation of progressive Left thinking, organizing from below, and strategizing with authentic worker’s organizations (which need to be built) and radical social movements. Perhaps then a progressive revolutionary Left will re-emerge in Nicaragua. It is and always was worth fighting for. Hicks: And finally, what do you recommend socialists read as background to the current crisis? Hanson: The best short read is the article “Capitalist development in Nicaragua and the mirage of the Left,” by William Robinson in Truth-Out: http://www.truth-out.org/news/item/44490-capitalist-development-in-nicaragua-and-the-mirage-of-the-left. The essential longer read in English is Dan La Botz’s excellent book What Went Wrong? The Nicaraguan Revolution: A Marxist Analysis, which will soon be out in paperback from Haymarket Books. Jack Hicks is a social research consultant and a university and college lecturer. He has written and presented widely about public policies across the circumpolar Arctic (especially Greenland and Nunavut).